CFUW Windsor holds an annual poetry contest for English and French grade 4-8 elementary school students in Windsor and Essex County. It is the brain child of member Rosine Mailloux. Rosine is a retired teacher and a poetry lover. Poems are judged by a rotating panel of CFUW members and friends of CFUW. 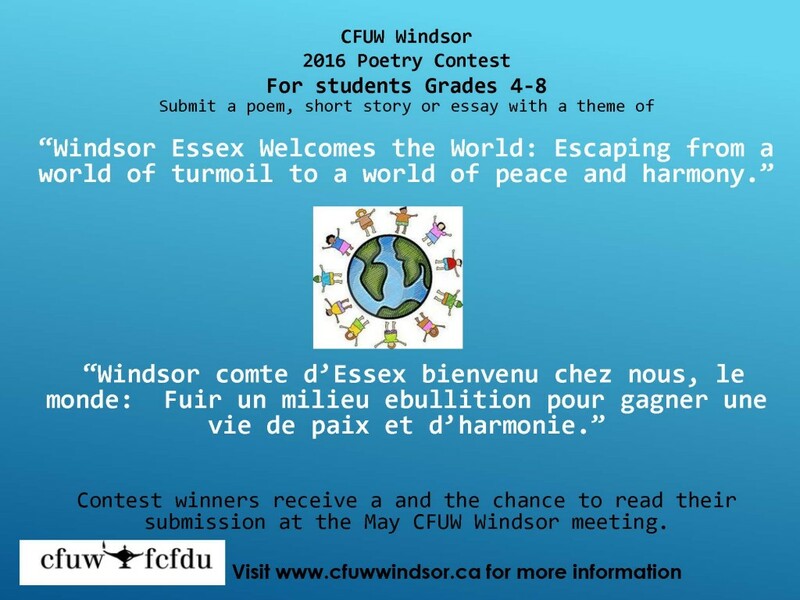 The theme for the 2016 poetry contest is: “Windsor Essex Welcomes the World: Escaping from a world of turmoil to a world of peace and harmony.” Or “Windsor comte d’Essex bienvenu chez nous, le monde: Fuir un milieu ebullition pour gagner une vie de paix et d’harmonie.” CFUW Windsor chose this theme to celebrate our open and welcoming environment for New Canadians and refugees. Again this year, CFUW Windsor is accepting 500 word short stories or essays in addition to poems as part of the contest. All submissions are due by Friday April 8th 2016. Submissions can be emailed in a Word document format to cfuwwindsor@yahoo.ca. Please reference the phrase 2016 Poetry Contest in the subject line and include the author’s name, phone number and address, age and class, and Each winner is invited to receive their award and present their work at the May 4th meeting of CFUW Windsor. This year’s winner’s prizes will be awarded as follows.